A recent post by John Q Public has lit up a firestorm among my awesome friends. 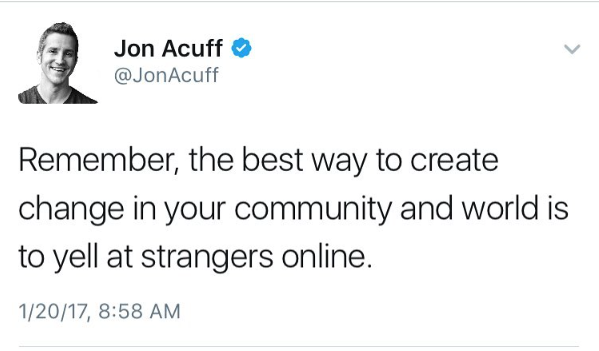 I used to read his blog quite a bit, but now I'm done. To wit, "What she doesn't have in her staged photo-op is a standard issue pilot in an Air Force standard issue flight suit, sleeves slightly curled, mustache unruly, exaggerated mach tuck screaming "f--- you Al Qaeda.'" Nice. I thought old school fighter pilot knuckle draggers were (mostly) a thing of the past, who retired when the F-4 did. Apparently they still exist and unfortunately know how to use Blogger. That's written in sarcastic font, by the way! 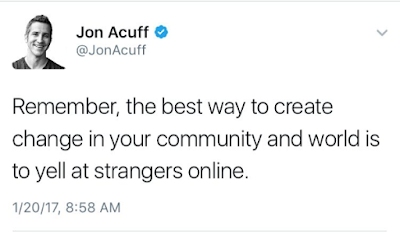 Jon Acuff is a much better John to follow. He's funny, loves him a good meme, and actually has a lot of good things to say, especially for those working their hustle.